some common sense solution to this matter. This New York Times article about author-funded book reviews is fascinating. Of course this isn&apos;t the first time alarms have been raised about the authenticity of online reviews. Who among us now ventures into Yelp, Amazon or the like without a healthy dose of skepticism? And doesn&apos;t this help spread the reviewing wealth embedded in those “You scratch my back, I’ll scratch yours” blurb exchanges among "legitimate" authors? I’m not sure this is evidence the self-publishing industry is any more “corrupt” than the traditional model, it just proves the power of opinion, and that there are ever more ways to buy influence and hype for your product. Nice local angle – University of Illinois at Chicago professor and data mining expert Bing Lui, who recently gave a talk in Beijing about “Detecting Fake Opinion in Social Media.” Lui’s definitely someone worth reading, if you’re interested in sorting out the online spam from the substance. This week The women who rock the Red Pump Project will be honored for their community activism. The group uses the allure of fashion and the "statement" power embedded in a bright red pump to promote awareness around HIV/AIDS, especially among women and girls. Their annual fashion shows are always fun and uplifting, and feature clothing both cutting edge and slightly off the cuff. Other honorees at the Fashion and Arts Humanity Fete include Kevin Coval, founder of Louder than a Bomb, friend of WBEZ, and a man who’s definitely got a way with words. A group of women rocking a different uniform are also hosting an event this week. The Chicago Sky return home to play the Connecticut Sun Tuesday. The Sun currently lead the WNBA&apos;s Eastern Conference, but Sunday night they got their shirt (jersey) handed to them by the Sky. So Tuesday&apos;s game is bound to have some great action - Sky point guard Epiphanny Prince racked up 15 points in the Sky&apos;s 82-70 win over the Sun. The team is locally owned and Tuesday&apos;s game is also a tribute to other independent businesses in the area. Look ahead This is your last week to see the Roy Lichtenstein retrospective at the Art Institute of Chicago – the show closes Sept. 3. But along with the arrival of the Labor Day weekend come some of the big shows of the fall season. 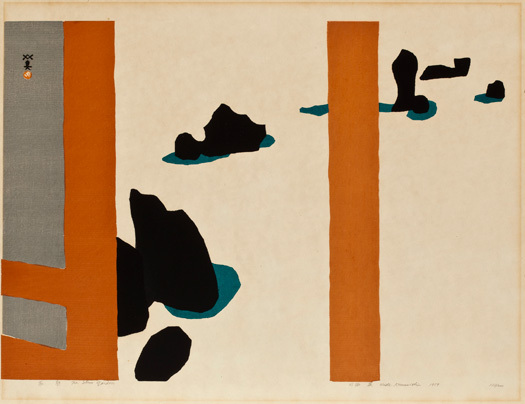 I’m particularly excited by the Smart Museum of Art&apos;s Renewal and Revision: Japanese Prints of the 1950s and 60s. Curated by the Smart&apos;s Richard A. Born, the show tracks the transition from collaborative (the “floating world” period) to individual-based practices. Our area has an incredibly rich and diverse print-making scene, but this exhibition is sure to provide new inspiration for local artists. Mea culpa Last week on Eight Forty-Eight Tony Sarabia and I had a fun conversation about the future of that American classic, the drive-in movie. As an alternative for carless urbanites I mentioned the Bike-in Movie Theater, but lamented that its season was done. Well, I spoke too soon! Michael Slaboch of the Hideout reached out to let me know there is one final screening on Sunday, Sept. 9th, and fittingly, it’s The Last Waltz.